Evergreen Cemetery, Red Wing, MN. 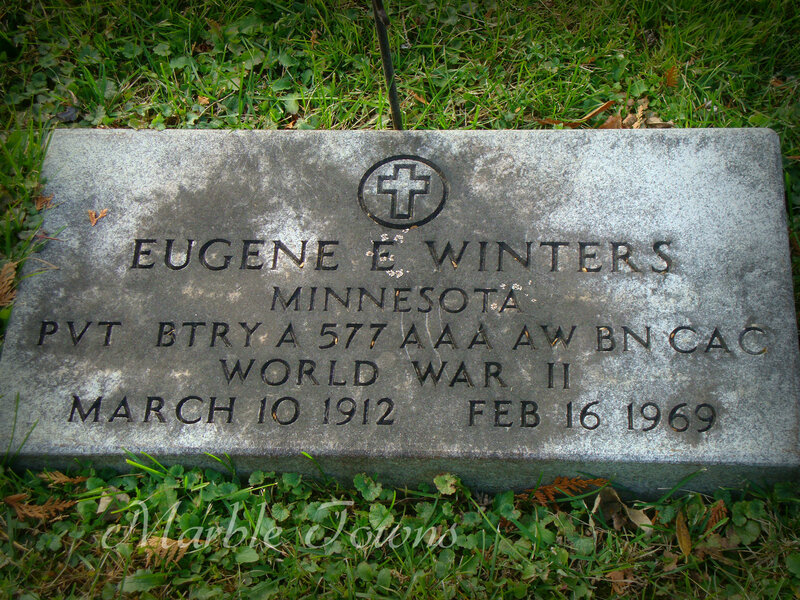 Looking on Ancestry.com, I found a Eugene Winters in the 1940 census, living in Wabasha, MN (which isn’t too far from Red Wing). His age is 28, and his occupation is listed as being a truck driver for a road company, and the census record shows he has a wife, Alberta, and one son, Dean, and two daughters, Marion and Arlene. I also saw that there were other families with the same last name, which included Harold Winters. Harold Winters is buried near Eugene, and I will do a post on him at a later date. From this census record, it looks like Harold would have been a nephew (?) of Eugene’s. Going backwards, the 1930 census shows Eugene as single, living in Wabasha, the third child of John and Matilda Winters (both hailing originally from Sweden). I did find the marriage record for Eugene and Alberta, apparently from Decorah, Iowa. That record shows Eugene, aged 23 and a farmer by occupation, married Alberta Peterson, aged 17. Both were showing a residence of Weaver, Minnesota (which makes me wonder about why this record is from Decorah, Iowa). Unfortunately, I wasn’t able to find any more information. And, sadly, I did find the obituary of Arlene Winters, who passed away on March 17, 2013. I am always interested in learning more, both about service in war, and about anyone that I am posting about — please feel free to leave a comment!